It is Invisible Illness Week! This is a week when the invisible illness community comes together to encourage each other and to help spread awareness of invisible illness. We want to let those with invisible illness know that they are not alone, and we want to help those who are healthy know how they can reach out to their friends who have an invisible illness. Earlier this year I was wondering how much longer I should participate in Invisible Illness Awareness Week. My illness becomes less invisible as time goes on. I use a wheelchair or a walker whenever I leave my home. If it is above 72 degrees, I have to wear ice pack attire. Even in my home I use a walker to get around more often than not. The assistive devices I use make my illness somewhat visible. At what point does my illness officially become a visible illness? I’m not sure, but I don’t think I’m there yet. I have noticed that even though I go out with a wheelchair or a walker, people who don’t know me still assume that I am healthy. When I am in a wheelchair I occasionally receive comments like, “What happened to your leg?” and “When are you going to be out of the wheelchair?” When I use a walker I receive some very strange looks. One time while using my walker someone commented, “You are so smart to use that… just be glad you don’t need it.” I had no idea what to say, so I just smiled. I suppose I look quite strange as a 30-something with a walker! My wheelchair, walker, and ice pack attire may be seen, but it isn’t obvious how weak and exhausted my body is. People can’t tell by looking at me that I suffer from migraines, gastroparesis, or dysautonomia. If I am especially fatigued, people might notice that I look a little tired. But if I put on a smile and make up, people usually can’t tell that I am tired. And unless they live with me in my home for a while, they don't see the week or two that it can take for me to recover from a simple outing. 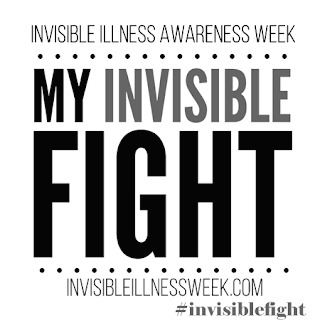 My illness is primarily invisible, so I am going to continue participating in Invisible Illness Week for now. The theme for Invisible Illness Week this year is “My Invisible Fight.” I invite you to join us in helping to spread awareness! Your fight is noticed. You are seen. You matter. And someone knows how hard you are trying. When we fight daily, silently, without any signs of our battle it can be exhausting. Join others who also battle invisible illnesses and increase awareness at the same time. There is a Meme “30 Things You May Not Know About My Invisible Illness”, you can sign up to blog for the cause, read guest bloggers’ posts, and get involved in the campaign on Facebook. There is even a free 80-page ebook when you sign up for email updates, with 263 tips! With nearly 1 in 2 people living with a chronic condition, about 96% of those people are suffering silently with invisible illnesses. Learn more at InvisibleIllnessWeek.com. This week on my blog I hope to share a little about my daily fight with invisible illness. I will be sharing encouragement for Christians who are persevering with an invisible illness. I hope to also share ideas for how those who are healthy can come alongside a friend in her fight with an invisible illness. If you have a question about invisible illness, feel free to leave it in a comment below, or send me an email. Just for fun I created a playlist for Invisible Illness Week. Most of the songs are Christian songs that encourage me as I persevere in life with a chronic illness and fight the good fight of faith. The last four are secular songs that are purely for fun. Enjoy! 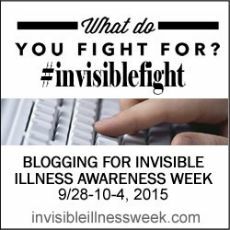 Are you blogging for Invisible Illness Week? If you are, you are welcome to leave a link to your blog in the comment section so that we can come read your posts too!